it’s really a shame that the federal funds can only be used for repairs and not, say, to expand service. fixing the canarsie tubes while simultaneously adding one or two new tunnels while the tubes are out of commission anyway could have been a godsend; for instance, potentially allowing an addition of some sort of express track in the most congested part of the line out in brooklyn, as well as, perhaps part of manhattan. oh well. An express track is not necessary for the L. Tail tracks at 8th Ave are. And those should cost less than the express track and be more beneficial (L could possibly operate 30 tph) than the express track. Have you ever stood on the 8th Av platform recently? The trains do pull in faster (thanks to ATO) but your not going to pull in the train at 8th Ave like you would at 6th Ave. Bumper blocks are a problem. Tail tracks are the solution. Look at 179th St on the F as an example. Anywhere in the world you will find trains that pull up to bumper blocks in the station move slowly towards them. This isn’t an MTA operation problem. Tail tracks arent the solution. As a former conductor, i can twll you that there are two difderwnt terminal speeds. One for stations like 8th ave (with and without tail tracks) where trains arrive and depart on the same tracks and 179th where trains enter the station, discharge pasengers, then (headong in the same direction, enter a “relay tunnel” where the train crew switches ends and then brings the train back into the station in the opposite platform on different tracks then the ones it arrived. Tail tracks arent going to spped anything up. Its against procedure. Even ay coney island trains arrive slow. Any terminal that has trains arrive/bepart from the same tracks see the speed restriction, tail tracks or not. Your English makes me question what you are saying. Please review your post before submitting your comment. If you say there are two different speeds used for stations, why do E trains in Jamaica, which have tail tracks (without ATO) pulling into Jamaica Center platform pull in faster than the L at 8th Ave platform without tracks (with ATO)? 1. Coney Island has timers on the approach to and inside the station, hence the speed restriction. 2. Track Geometry. There are curves at the northern and southern ends of the station, hence the timers. 8th Av and Jamaica Center don’t have curves (they are there, but not as sharp as CI, so they are not affecting terminal capacity) on approach. 8th Av only has timers in the station due to bumper blocks (and as fixed-block signalling). Jamaica Center (both E and J/Z) probably don’t have timers in the station, but I don’t know for sure. At the Jamaica however, trains pull in slowly at the eastern end to avoid hitting the red signal at the end of the platform. I was typing on my smartphone hence the errors. Trains at Jamaica center are suppose to pull in slowly and do have timers. The signals are farther apart due to its original design to extend both lines. A lot of crews are veterans on the line and know those lines down to the timing of when those signals change. At 179th st as i mentioned, trains do not leave the station manhattan bound on the same tracks as the arriving trains from manhattan. So let me state this clearer, no matter the layout of the terminal, any trains that has trains arrive on the same track they are departing from are suppose to arrive at a restricted speed, timers or not. Coney island is a good example because of the bumper block point that you pointed out. It has none but because trains arrive and depart on the same track. This is to prevent overruns of the station which may, in the case of terminals, freeze up signals preventing the train to depart in the opposite direction. Now the reason why the L still does this even with ato in operation is based on the long time standard operation procedures. That and iirc from my conductor days, train operators are required to mannually operate the train for atleast one trip. So sometimes trains arrive under manual control. Mike, you have your facts mixed up. The train that hit the block at 8th Avenue was in ATO mode. Something went wrong with the distance estimate between the train and the way side computers. Cases of humans crashing into a block within the same time frame remain at 0. I have no inside information on this issue, but just thinking about it for a minute, you can’t design a system where trains proceed at full speed into a station expecting that the computer will stop them at the exact right speed and timing to just kiss the bumper block…ie running right at the limit. Why? Because if the computer failed and humans had to step in, by the time the human is able to react, you’ve passed the point of no return and the train cannot stop in time. As far as I know, a core principle of signal design is room for error, even with ATO. I mean it makes sense, (and as a passenger, I certainly HOPE that’s the case!) Therefore it stands to reason that tail tracks would allow faster pull-in speeds in most situations. Disregarding the fact that any new facility, such as an additional East River tunnel for the L or an express track tunnel somewhere in Brooklyn, would have to go through an arduous environmental review that would take years and would require significant property takings in some of New York’s most popular neighborhoods (both for construction and operation), these additional facilities would be useless upon the restoration of the existing east river tunnels. Unless the whole line gains additional trackage, the two-track sections would govern the total capacity of the line, which would be the same as today. As bigbellymon correctly noted, the Canarsie tube is not a bottleneck today for L service, it’s terminal at 8th Avenue lacks tail tracks used to store trains not in service or turn trains past the station, instead of between 6th and 8th Avenue stations. The lack of tail tracks forces the L to proceed slowly into 8 Avenue, which lengthens the time it takes to turn the train around to head back to Brooklyn. This is the bottleneck in the system. Unfortunately, as you correctly noted, the federal funds for Sany repair won’t help with this bottleneck and can only be used for restoring what already exists, plus some minor modicum of storm resiliency, such as making the fan plants a little less susceptible to flooding. It’s an unfortunate problem that the federal support can’t help us make small but significant improvements that would help add capacity. Unfortunately though, there are few pieces of low-hanging fruit like this one that are relatively simple or straightforward capital improvements that would result in capacity gains. Another piece of low-hanging fruit is separating the Franklin Ave junction between the 2/3/4/5 in Brooklyn. Some others might be tail tracks for the 1 and E in Manhattan, for the J/Z and E in Queens, and for the 2/5 in Brooklyn. There’s plenty of low-hanging fruit like this that’s incredibly frustrating. On the L, the spur at 6th Av could have switches added on the west end to allow certain trains to drop out there. Alternatively, of course, tail tracks at 8th Av could be built. The junction at Franklin Av needs to be untangled, but that’s another story for another time. If you were to break open the wall and put in tail tracks for the E in Manhattan, it would link up with the Broadway line tracks lying directly beyond the platform end-wall. Also, none of the services you’re mentioning are at the limits of turn-back capacity, and only the 1 would conceivably be at those limits in the future. Only the L, the Nostrand Ave. line need tail tracks today and don’t already have them. Franklin Junction just needs two more switches. The 1 might need tail tracks, but not necessarily right now. The E can’t have tracks in Manhattan, but already has tail tracks in Jamaica (the J/Z also has tail tracks in Jamaica). The 2/5 could receive tail tracks, but the Franklin Junction would need to be resolved first. I disagree with your sentiment that a new tunnel would be useless. The long-planned Utica-Williamsburg line could use it to get to Manhattan. Where it would go from there is not clear as of yet, but thinking ahead is a plus in situations like this. Thinking ahead is all well and good until you get to the point where the system is littered with the products of “thinking ahead,” miles and miles of provisions for grand plans which amount to even less than nothing; per Second Avenue Phases 3 and 4, a provision that would have allowed for cross-platform transfers between 2 and 6 Av services at Grand St and an upper-level transfer provision at Houston St were both discarded in favor of new build deep bore stations beneath the existing provisions. “Well, maybe we can use this one day” is a flimsy excuse for spending money in the best of times and these are far from the best of times. If you want a parallel tunnel, you need a solid plan, one which relies on more than “well maybe this could be one day used for Utica Av trains maybe,” a plan which – as I repeatedly stated re: the futility of Bronx tail tracks and the refusal to acknowledge that 125 St service precludes Bronx service in Second Avenue as designed – needs to pass CBA, which means actually utilizing as much or more capacity than it creates. The Rutgers and Montague tubes are both under capacity. Montague could be (should be) filled by some combination of JWZ trains, but Rutgers can’t be filled by anything unless and until Second Avenue is extended past phase 3 and then only if a connection is built. As Brooklyn’s population continues to grow, it is increasingly obvious that a Utica subway will need to be built at some point. Williamsburg has grown so much that the L is well past “creaking at the seams” level and needs a relief line. Ergo, a river tunnel will need to be built relatively soon. Why not use the river tunnel as a detour from the existing tunnel if it’s going to be built anyway? Provisions are to be encouraged, because it is much easier to tie in to existing provisions than to interrupt service to surgically attach new lines. The provisions at Houston and Grand could be used, since there is a large park in the area as opposed to buildings. The choice to deep-bore is more for political than engineering reasons. The Archer Avenue line, Clark St tunnel, and Phase I of SAS, among other lines, used provisions. It costs much less to build a provision in the first place then add a junction later. And there we have the real problem! Engineering wise, there’s no reason you can’t build a new tunnel right now, just like there’s no reason you can’t go back and change from deep-bore to leveraging existing provisions. The problem is a purely political one: people don’t want to spend money, and they especially don’t want to spend money on a product that from day one and into eternity is never going to be more than half as useful as a competing project built elsewhere. Just like Second Avenue will never extend into the Bronx because of the requirement to extend service to West Harlem instead, an Utica Subway would not be built around a tunnel established to provide relief to the L train when that tunnel by its very nature is impossible to fill. That’s a purely political problem, but it is nevertheless a real problem. That’s a lot of prerequisites, and a lot of room for ruffled feathers. Again, it’s all possible in terms of engineering, but the problem has never been the engineering: it’s been the political will. The L is busy, but far from “creaking at the seams,” and I say that as a daily rider. It needs more capacity, but that could be handled by far less infrastructure than a new tunnel (a higher terminal capacity, mainly). Utica subway proposals seem to forget that it’s a block away from the JZ, which operates way under capacity (according to the MTA figures I’ve seen, it’s running at 72% of its trains per hour capacity, and those trains are at 61% of their passenger capacity; the M trains are also shorter than they could be). I’m as nostalgic about the Second System as anyone, but only when the JMZ trains are full should we be talking about basically building a duplicate route. To be fair, Utica Avenue is nowhere near the Jamaica Line, and the only part of an Utica Subway that would be is if the connection to Manhattan went via Houston St – Grand St (which, if you’re trying to get the tunnel built as a relief effort for the L train shutdown, it has to). Here’s a few alternatives for expanding service in this part of Brooklyn/leading into an Utica subway, which if nothing else, kept me entertained for a couple of hours and demonstrates how easily subway lines can be drawn on a map and how the engineering feasibility of any given line is almost never the obstacle that prevents it from getting built. *than to add a junction later. L trains are “turned” in station be the operator switching ends. The lay up track between 6th and 8th aves are not used for turnarounds. The bottleneck is the high frequency of the amount of trains on the line. Theres only 2 tracks and crews are switched there. The MTA reports to the governor, not the mayor, so they really couldn’t care less about releasing a report (unless Cuomo tells them to). Shame that is what it has come to. The damage probably isn’t that bad. They just want to be able to spend federal dollars… especially since they’ll get that new 1st Ave. entrance. Regardless… they should add a new line through Williamsburg anyway, considering it’s growth… and then extend that line to Utica Ave. Tax new development and you have easy money to do it. It’s really easy to build new lines using a value added tax… if they’d just allow it… compared to fixing old lines which is needed but doesn’t add any value to commuters. Why can’t you add a tax when you fix old lines? Because no new development to be taxed will occur as a result of the repair of old lines. If the repair increases capacity, like L tail tracks – why not? Considering that the MTA since the 1980’s has been investing in state of good repair and better operations in its existing lines, and has seen ridership grow to its highest levels since World War II, when the system was slightly larger than it is today, I can’t see the evidence that state of good repair (however nebulous to obtain) hasn’t added value to commuters. But I don’t disagree with your overall aim of adding new lines, especially in areas that have developed significantly beyond what existing service can handle, plus service out to underserved areas. Similar mechanisms to value-added taxes already exist in New York. The maintenance and upkeep of Brooklyn Bridge Park is to be paid for entirely with the property taxes paid by the residents of the developments in the park. The 7 extension to Hundson Yards was financed by the city, who expects to be repaid by the special tax district they created around the development (which they undermined by offering tax breaks). For the MTA to use these mechanisms, the city would need to agree to significant upcoming along the line to spur new, denser, more valuable development, plus the state via the governor would have the give the MTA the right to bond against the future taxes in the value capture district, and the city would have to agree to set aside those taxes for the MTA bonds. Depending on your assessment of the current state of New York politics, this may or may not be possible. Hudson Yards Infrastructure Corporation continues to blight the city’s budget reducing real estate tax collections and adding hundreds of millions of dollars each year in expenses to cover financing. The projections used to gain approval of the scheme have proven to be vastly inaccurate. The experience of the 7 extension should not be repeated. So true, Hudson Yards has been a failure after a decade.So many subsidies given to office developers in an awful location for offices. Expect NYC to shell out more $$ to cover the costs of that 7 subway. What you are saying is use all the new taxes associated with development for transit, leaving no money to fund the other services those residents will use. What the housing advocates are demanding is to use all the taxes associated with new development for affordable housing, leaving no money to fund any services the future residents will use. In each case, because the money is taken off the top, other priorities are not considered. In reality, what Generation Greed has arranged is for all the taxes associated with new development to be used for existing debts and past pensions. Leaving no money for transit, housing, or anything else. The past state of New York politics makes a great deal impossible. That’s not the impression I get. I get the feeling that the riders want the MTA to just do nothing but patch, even if that means that someday the tunnel will become unusable out of the blue, as long as that happens sometime in the future — when they will hopefully be gone. What you say they fear is actually what they want. I doubt it’s possible here though, mostly because of the bureaucratic BS that’s present in every part of every construction project the MTA does. Obviously it’s different. Imagine how long MTA would take to do a similar project, and use the analogy to see how much more efficient this tunnel repair can be. Granted in this video the tunnel was already built they just needed to create the portal. I understand the purpose of the video, but the MTA is probably not going to pay for all that manpower. so in the worst case the MTA has a huge pot of money they have to use for Sandy repairs. probably one project for Sandy repairs and they have decided on the L even though it may not need all that work. maybe they are planning a phase 3 of the SAS soon and want to fix the tunnel for a future connection? or maybe do part of phase 3 and connect it to the L line and need the tunnel in the best condition possible to handle the traffic? The whole Canarsie line was just rebuilt. In other tunnels you could say Sandy was a break — federal funny money to fix up tunnels that would have needed fixing up soon anyway. Not in this case. It was done. They could take this opportunity to rebuild the platforms along the L to take ten-car trains, but I haven’t heard any signs of that happening. Canarise yard might be able to handle 10-car trains, but ENY yard can’t handle them. If you want longer trains, they might be able to create 9-car trains and store them (4-car and 5-car sets, which both yards should be able to handle). If the adjacent gas station and Popeyes were to be purchased and demolished, ENY Yard would suddenly have plenty of space. That said, most of the platforms along the L can already accommodate 9-car trains. They used to run 8 cars of BMT standards on the line, which are 4 feet shorter than 9 cars of NTTs. Purchasing that gas station and Popeyes (can’t forget the car wash ?) would have plenty of space for 10-car trains at the ENY Yard. But where would the space come from for the maintenance? In Canarsie Yard with the homes that line the eastern side of the yard (along Glenwood). But in Canarsie, would it be too ambitious to lower the yard tracks so they would extend under the bank and roadway for the buses? Just a thought. Wrong. The whole SIGNALLING system was rebuilt. And, technically, it wasn’t as the fixed-block signalling is still there with CBTC overlaid (fixed-block is used for the NON-CBTC trains which run occasionally along the tracks). Unless you have reports that bench walls, relay rooms and platforms were repaired, upgraded and repaired respectively, then you can say “the whole line was rebuilt”. I don’t have a source to either confirm or deny, but would it not have been incredibly stupid to do all those shutdowns and then not improve the infrastructure? About the signals, the only signals remaining are at interlockings. It’s almost purely for work equipment to be able to run – 20 minute headways are about the best that could be managed without CBTC. It would most certainly have been incredibly stupid! But it also would have saved a few bucks at the time. Funny how that works out, isn’t it? The reason why I say that they have not done infrastructure work on the L while upgrading the signalling system is because most of the platforms don’t have the tactile stuff at the edge of the platform (except from Broadway Junction south to Canarsie, Wilson Av which is being done now with ADA work, and Grand St which is having it’s staircases redone and a handful of other stations). Some stations look like no work has ever been done in them. Granted this is the view I get when looking out the window so it may be different from station. Concerning the signals, they are still there from Broadway Junction to Livonia St (probably for access for diesel trains to/from Linden Shops). I read somewhere that they could operate 12 or 15 tph if CBTC failed (probably in the RPA report about installing CBTC in the system). I believe the signals extend to Canarsie because that’s where the car wash is for the Eastern Division. There are no signals north of Broadway Junction though, except at interlockings. There’s no way to run anything remotely resembling a decent service when the signals are half a dozen stops apart. Who cares if the MTA is losing its PR battle? Obviously, the MTA can and should do a modicum of PR. 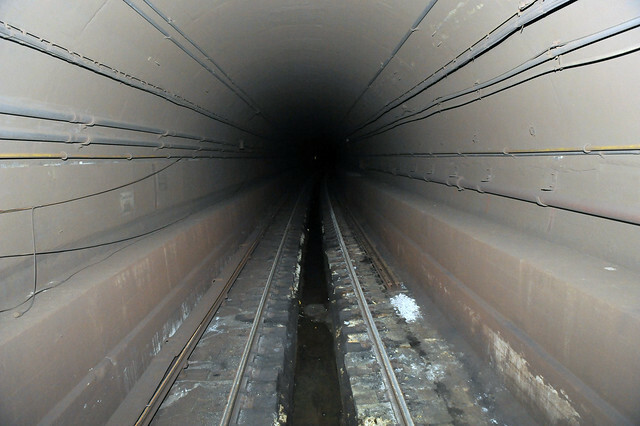 But at the end of the day, the tunnel is in great disrepair and negative PR changes nothing about whether the work is needed, nor the MTA’s authority to perform the work. I doubt that an L passenger will be willing to get the L to the G to the J/M/Z (then maybe to some other line), and even if they are willing to, people shouldn’t be encouraged to do so. People should to be told to either walk/bus directly to the J/M/Z or get the G to Hoyt (for the A/C to Downtown) or Court Square (for the E/M/7 to Midtown). Piling everyone on the Jamaica line isn’t helpful. There ARE cross-over switches at both ends of the tunnel to allow trains to use either track. In the online debates over this issue, the idea of single-tracking was thoroughly discussed. The L-train operates about 20 trains per hour in the rush hours – with each train filled with passengers. The L-train also has huge loads of riders on the weekends, days and week-nights. The L-train carries about 200,000 people per day! The basic problem is that the amount of passenger traffic load is just way, way too high at all times for any single tracking plan to deliver enough riders over that given period of time. Even the idea of sending a rush of trains in one direction, storing them in Manhattan and then sending a rush of trains toward Brooklyn – would mean very long waits between trains. This very point was hashed out repeatedly. It is not that the equipment is or is not there for single tracking – it is simply that the ridership loads are very, very high. 2’s went via Lex in the “wrong” direction and 3’s ran to 137/CC. There aren’t really any alternate routes for L trains, though. They single tracked on weekends only. So because there’s no way to get 200,000 people through a single track on the tunnel, you’d prefer to get 0 people through the tunnel? As mentioned above – there is no engineering reason why we can’t push through another tunnel. It’s all political. This is a political problem. Maybe you can only get 50,000 people through the tunnel if you single-track it. That’s 50,000 more people than you’re getting through a) a closed tunnel or b) a tunnel that doesn’t exist except on maps and plans and as “provisions” that may ultimately be entirely discarded in favor of brand new infrastructure for – you guessed it – political reasons. Are 50,000 people worth the repairs taking over twice as long due to single tracking? Who knows? That’s a conversation worth having. Shutting that conversation down because “well we can’t service all 200,000 people by doing this” is – or should be – a non-starter. Yes, if you shut one of the tubes and single-track trains yes you would be able send approx. 50,000 people through the other one would be beneficial, but the bigger problem is that out of 200,000 people that use the tubes, how many would use other modes for traveling to Manhattan? Not 150,000. Some will go to other routes, but most of them will see it as “the line is open, so it is usable.” So, the argument to shut only one tube and extend the the construction time is fruitless as there is plenty of capacity around the L, the only problem is that it is far away. If the Myrtle Junction is able to process a minumum of 25 tph and in Queens the trains are shuffled around (M moves to 63rd and a the V running from 2nd Av to Queens Plz, terminating on the Center track past the station), the L riders are able go use another route into Manhattan (A route that has a plenty of capacity for the L riders, if it is created). The argument isn’t fruitless. 50,000 people likely represents the portion of people who have no real alternative plus the portion of people who may have an alternative but will, as you say, decide the L is usable enough and stay with it. The truth is that people will be forced by the capacity crowding on the L to go to other routes, just the same as they’ll be forced to go to other routes if the L is closed and a shuttle bus is implemented instead. In any scenario (and let’s be clear, there’s only four real scenarios here: whether one or both tracks close, whether the closures are part time or permanent), there should be alternatives created and patches implemented to maximize the amount of service crossing the river. The M can be increased to full-length trains. The V can’t be restored and no additional M trains can be created because there’s no more room on Sixth Avenue, but there is room for at least 6~8 more J/Z trains operating at rush hour (and it goes without saying that rush equivalent service ought to come to the AC and JMZ for the duration of repair work.) Full and permanent BRT is even more ludicrous than the prospect of another tunnel (for a number of reasons), but temporary jersey barriers are cheap and a great way to enforce exclusive bus lanes on the Williamsburg Bridge for a temporary L bustitution. The R switching from the 60 St tunnel to the 63 St tunnel doesn’t create any additional capacity per se but solves the problem of 60 St being overcapacity, improving operations if nothing else. None of that precludes keeping one track open for the L. None of that necessarily means that keeping one track open is even a good idea relative to closing everything and getting it done faster. But the conversation about whether we can or should keep any part of the L open is a separate conversation from what other remediation we can/should implement during L train repair. The argument is fruitless depending on the perspective: keep one tunnel open so it is a 18-24 month shutdown, or close both for a 12-18 month shutdown. It makes sense for L service restored ASAP, with the shortest amount of disruption, especially with it’s high ridership. M trains can’t be extended to 10-car trains as the platforms from Delancey-Essex to Middle Village can’t hold the trains (hence the L/M/J/Z being called the Eastern Division). 6th Av local tracks have space (14-15 tph for the F, 8 tph for the M. Remaining = 7-8 tph if the tracks can handle 30 tph). That’s why I was creating the 2nd Av to Queens Plz route to use the leftover capacity. A/C are operating at capacity (in the full line review, 26 tph is the max, which is what is operating now. The switches east of Hoyt-Schemerhorn can only handle 26 tph. Also,trains are not at capacity according to loading guidelines). The J/M/Z can increase in capacity, depending on how Myrtle Junction is handled and the track capacity from Myrtle Av to Delancey-Essex. Switching the R won’t affect the L riders coming of the G at Court Sq, so that’s a non-starter. Switching the M to 63rd and using the extra space created to run a 2 Av to Queens Plz route would help and wouldn’t affect the R.
Keeping the L open shouldn’t be separated from the solutions used for the displaced riders when the tunnels are closed because if the solutions for the displaced riders are not adequate enough, then a single-tracking will have to be used. If not, close both to get the work done faster. It may even come in early and under budget like the Montague Tube work. Creative single-tracking on the L can carry over 50% of the people that the line regularly carries. Let’s round this down to 50%. One proposal I’ve seen has the L truncated to Broadway Junction, with additional M trains running between Canarsie and QP (these trains would conveniently avoid interfering with the J/Z). Bedford Avenue would likely be closed to not have ridiculous dwell times on the single-tracking trains, and a shuttle bus can be run to take those passengers to the G or J/M/Z. Full length G’s (to take L refugees), along with doubled M service and perhaps some shuttle busing to the nearest J/M/Z stop should be able to accommodate 50% of the L’s ridership. But there’s no way it will work for 100%, which is why a full shutdown is infeasible. Single tracking can not be done during peak hours. Too many people, too few trains. The work needs to be done. Every east river tunnel south of 60th St saw extensive flooding of millions of gallons of salt water affecting cables, rails(basically anything metal) and salt water on the trackbeds can create cracks which disrupt the smooth and efficient movement of hundreds of tons of trains. At 8:00 am, Manhattan bound L train #1 leaves Lorimer. It crosses over (if necessary) to the open track, then runs nonstop to 8th Av. Following closely behind it is L #2, which stops at Lorimer and then nonstop to 6th Av. Closely behind that is L #3, which stops at Lorimer and then goes nonstop to Union Square. #1 reaches 8th Av at approximately 8:09am. * At the same time or even slightly earlier, #2 has reached 6th Av and #3 has reached Union Square. By 8:10, #1 is ready to depart. By the time it reaches Lorimer, at 8:19, #2 and #3 will have already left. One minute for contingency and switching time gives 8:20, when the cycle can begin again. The net total is 9tph, or slightly less than 50% capacity. Frankly, I’m not sure where else this extra capacity would come from. The J/M/Z and G will be packed as it is. Also, I’m unconvinced that the work should really take as long as they say it should, but that’s a different story altogether. *Running time from Bedford to 1st Av (no stations so full speed) is 4 minutes. Lorimer to 8th Av is twice as far as Bedford to 1st, giving 8 (slightly less, actually, because of acceleration and deceleration time). Add one extra minute for switching time and miscellaneous delays. What about keeping the L open with single tracking, but removing all or most seats from the train cars to increase capacity? I’ve seen folding seats on trains around Tokyo and it seemed to work quite well during peak times.